Local celebrity bartender Fede Cuco has embarked on a special adventure. Known as the Cantinero Viajero (Travelling Bartender), he has taken upon paying visits to different bars around the city with a suitcase full of elixirs. 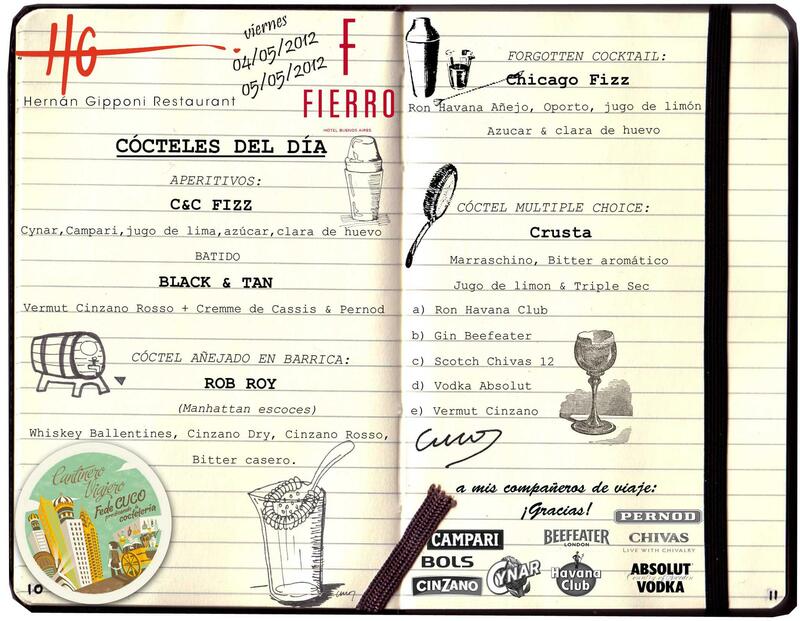 This weekend he will be traveling to Fierro Hotel’s Hernán Gipponi Restaurant where he will prepare some of his unique recipes. The menu will consist of five one-of-a-kind cocktails including a homemade Rob Roy matured in an oak barrel! He will also remind us of the wonders of an old time classic, the Chicago Fizz. Other delectable drinks to be served include C&C Fizz, Multiple Choice Crusta, and Black & Tan. Don’t miss this chance to share the stories of your trip with this unique traveler who will be at Fierro Hotel on Friday the 4th, and Saturday the 5th of May from 7pm onwards. Soler 5862, Palermo. 3220-6800. This entry was posted in Buenos Aires Agenda, Food & Drink and tagged Agenda, argentina, buenos aires,, cocktails, drinks, Fede Cuco, fierro hotel, hernan gipponi restaurant, nightlife, Palermo, recomendations by Fierro Hotel Staff. Bookmark the permalink.